Earlier this month I hopped over to Venice for a couple of days. A film my husband produced was premiering at the film festival so I tagged along for moral support and my fair share of pasta. Soon after arriving at the hotel, the movie’s director headed for a night out with his charming wife, the rest of the crew made for the bar, leaving us footloose and fancy free for the evening. Without a moments hesitation we hailed a taxi and sped away from our little island, headed for mainland Venice. And nowhere in the world are taxis as glamorous as they are in Venice! We sailed through the lagoon, taking in all of the sights and sounds, breathing in the scent of impending rain as we watched the storm clouds gather over head. Blissfully happy just to be together and starting a new adventure. 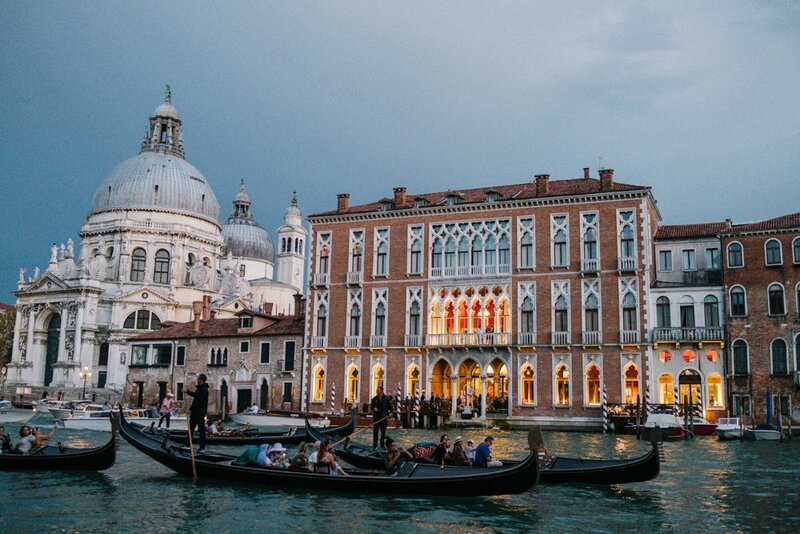 It wasn’t long before St Mark’s Square loomed into view and the waters filled with gondolas. We arrived just as the sun started to set. Heading for what everyone’s first stop in Venice should be. Giuseppe Cipriani opened its doors in 1931 and it remains one of the world’s most famous restaurants. Achingly Italian and deeply old fashioned, Harry’s possesses an old world charm that’s impossible to replicate. It’s dark, it’s small, it’s as far away as you can possibly get from “Instagram Friendly”. It is quite simply heavenly. And perhaps most importantly it’s the birthplace of the Bellini. My favourite cocktail, a mixture of white peach juice and prosecco. I have been known to settle for many an imitation, but there is just nothing quite like a Cipriani Bellini. Having one at Harry’s Bar is bucket list worthy. Be sure to sit at the bar, as Hemingway did, and nibble on the fried cheese sandwiches, too. The barman will happily slide you a postcard to send home, too. They offer a non-alcoholic Bellini, which sadly tastes very little like the original but is better than not having one! After drinks we strolled through the dizzying maze of streets, spirits undampened by the rain. Savouring the smell of cool rain soaking into the hot streets. Petrichor is the word for this, if you’ve ever needed it. It happens to be one of life’s greatest pleasures, and unlike everything else in Venice – this particular pleasure doesn’t cost an arm and a leg! We didn’t venture far off the beaten path for supper. Choosing a table beside the Grand Canal at The Gritti Palace. Where waiters in penguin suits scooped steaming spoonfuls of Hemingway Risotto onto striped plates as gondoliers punted by singing their hearts out. The most wonderfully romantic start to a Venetian adventure we could have asked for. A miniature version of our wedding cake. When I die and go to heaven I’m quite certain it’ll be Italian.